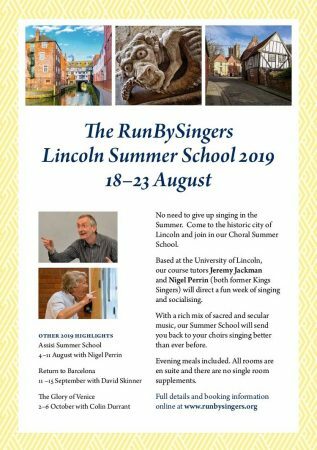 I’m writing to let you know about a free singing opportunity on 18th May. 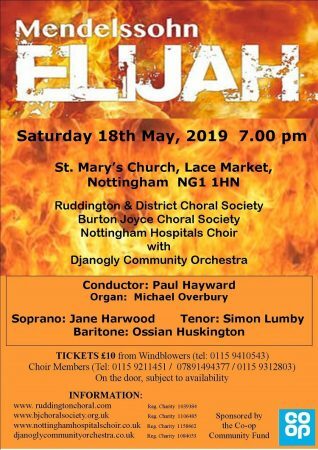 As well as conducting Mansfield Choral Society, I also work at Nottingham Cathedral as the Youth Choir Director, alongside Director of Music, Alex Patterson, who many of you met at the recent ‘Come and Sing’ day. We are running a fundraising HYMNATHON and Gala Concert on 18th May at the Cathedral as part of the celebrations for its 175th Anniversary this year, and to help cover costs for taking our youth Choir to Lourdes in July as part of the Diocesan pilgrimage, where they will provide the music for masses alongside the Cathedral Choir. 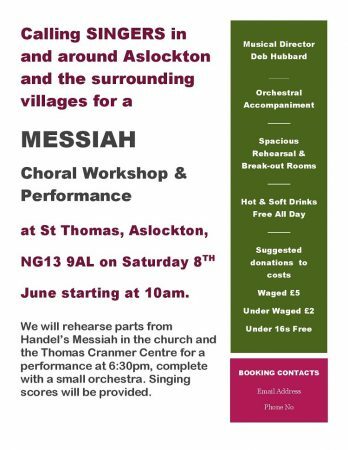 Three pieces in the concert will be performed by a Massed Choir made up of local singers, and there will also be lots of hymns! It’s free, and everyone is welcome – the more the merrier! We would love to see you there. Sylvia and Robin Aldworth have played an enormous part in the life of BDCS over the past twenty years. 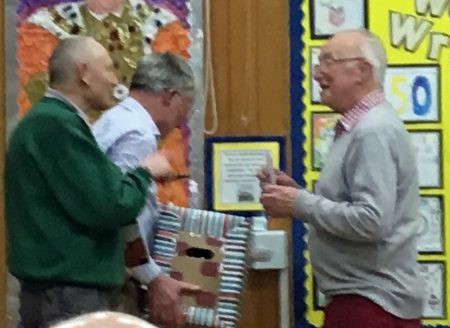 Choir members took the opportunity at our last rehearsal to acknowledge Robin’s particular contribution as graphic artist, photographer and producer of our concert programmes and publicity. 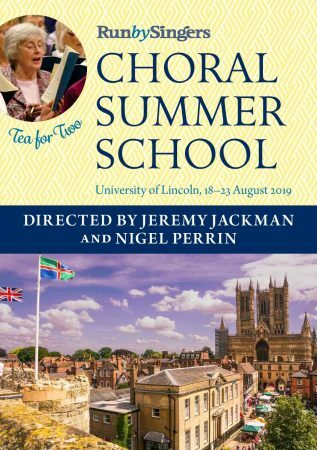 His valuable skills have enabled us to promote the choir and record important moments. He has always approached the assignments with energy, patience and humour, however unreasonable the deadline! We will miss both Sylvia and Robin when they move to Cheshire. We hope they will miss us too and that the case of carefully chosen wine will help them settle into their new life. Once again this year, members of the choir and the audience at our Christmas Concert were invited to donate to Framework, the charity that tackles homelessness across Nottinghamshire. The appeal raised the splendid sum of £488.45. 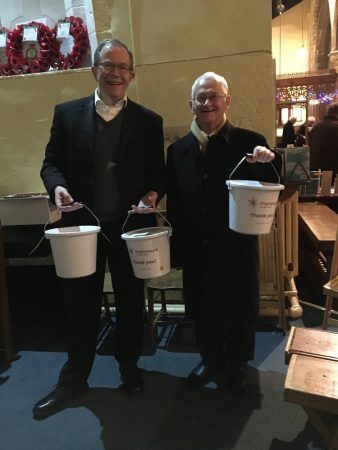 Here are Guy Turner (l) and Douglas Travers with some of the Framework collecting buckets on the night. 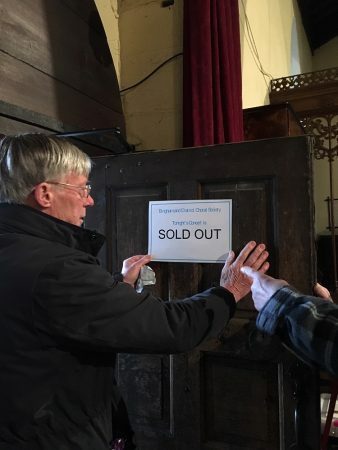 Despite the dreadful weather, the BDCS Christmas Concert on Saturday 15th December 2018 at St Mary’s Church, Bingham, was sold out once again. Our thanks to everyone who made it such a special event: Bingham Brass with their wonderful seasonal sound, the delightful Carnarvon Children’s Choir, and our accomplished organist Simon Hogan who supported the choir and took us on a sleigh ride of his own. I had not intended running this year, but at the committee meeting in September ‘we’ decided that I should. I would not be able to run until a few weeks before the event as Sue and I were off to Italy the morning after the committee meeting. On return I managed some long runs and felt reasonably confident that I could get round. Sunday 14th October was wet, and cool if not cold. I decided that I would run for the first few miles in an old jumper I could throw away and this was covered by a black dustbin liner to keep me reasonably dry. To my surprise, it all went well. The circuit had been nearly all reversed, which meant that what was previously a killer hill towards the end was now a fairly relaxed decent about a mile after the start. I also chatted to another runner for about seven miles which helped. I kept the bin liner on for about 3 miles and the jumper for six. 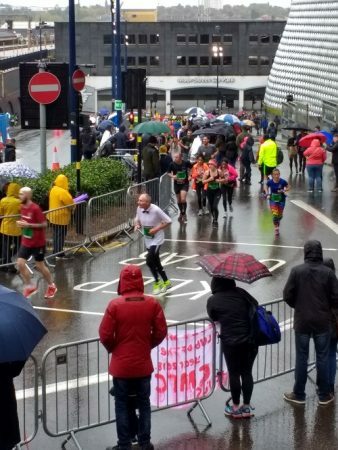 I think I managed my run better this year and felt a lot more comfortable, although very wet towards the end. Thanks to all the members and one or two others who sponsored me. 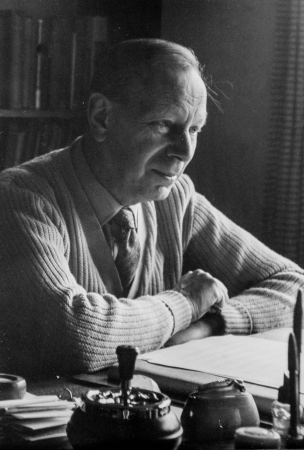 Forty-four years after the death of the prolific English composer Eric Thiman (who had more than 1300 pieces published in his lifetime), a setting of Psalm 23 receives its premiere on May 11th. The manuscript was recently unearthed amongst Thiman’s effects, and is definitely in his hand, but it is unusual for a number of reasons: (a) Thiman did not, as a rule, keep his manuscripts; (b) Thiman nearly always wrote sacred music with organ and secular music with piano; (c) the copy, though very clearly in Thiman’s hand, does not carry his name; (d) in several respects, the piece is stylistically rather different from much of Thiman’s music. The most curious thing though is that where Thiman’s name would normally appear there is the word ‘Paulatim’. On investigation it turns out that ‘paulatim’ means ‘little by little’ in Latin, and Thiman’s niece Frances has made the possible connection with ‘Eric, or Little by Little’ the title of a popular Victorian children’s book by FW Farrar. Knowing how much Thiman and his brother loved humorous word-play, Frances wonders whether Paulatim was used as a code-name. A possible explanation for the existence of this unpublished piece, and the use of ‘Paulatim’, is that it might have been intended as an entry for a composing competition, and that Thiman was disguising both his name and his style in order to throw the judges off the scent. The manuscript is dated July 1962 , when Thiman was very well-known, so entering a composing competition would seem odd, though, if he did do so (possibly for amusement, or maybe to fox the judges who might have been friends of his? ), disguising himself would seem less so. An attractive and lyrical piece, like all Thiman’s music in an approachable, conventional idiom, The Lord is my Shepherd receives it’s premiere conducted by Thiman’s archivist, Guy Turner.